The other day at my ‘9 to 5’ I found simple joy as I walked back to my office with my hand-crafted wood-fired wheel-thrown pottery coffee mug. I gazed at the hot coffee swirling around inside my mug. And I was happy to know I’d be soon drinking the coffee, as it cooled down a bit. I marveled at the mug in my hand, admiring the handle, the curves, the tapering base, the strong bottom, and the slightly protruding rim that my lips contoured with every sip. A smile was on my face as a co-worker came around the corner. I was happy to share in that brief moment that I was simply enjoying my mug. I was in appreciation of creation. Here is a link to my current wood-fired series of pottery creations: www.etsy.com/shop/oneidasharkpottery. 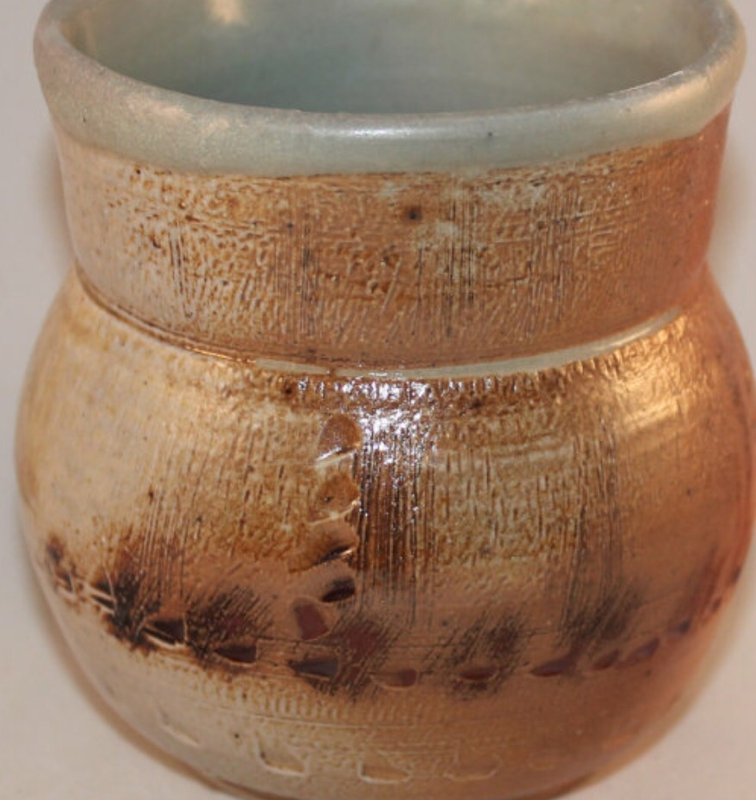 One of the great majestic mysteries of creating something, even in pottery, is the impact of the result. The resulting feeling of seeing the final piece in your hand, can begin as awe, shock, delight, or even disappointment – however, in another moment, another day, and even in the hands of someone else that very same piece can bring forth another set of feelings, and when those feelings or impressions are shared then a whole new experience/feeling/appreciation is available to savor. This process is part of the heart-based experience, and is as equally important and necessary and cherished as the first moment of intent (e.g the moment the potter first asks, “What am I going to make?” as he or she then grabs a chunk of clay). As I remember the process of creating this vase I can see myself at the wheel while being surrounded by other potters and artists sharing their lives, their energies, their loves. I know that this vase, as small as it is, represents their stories, my story, perhaps a chapter of the bigger story, in every mark, line, location, and depth. The next wonder is where this little case will find a home, what functions will it serve, what new stories will it be able to create.